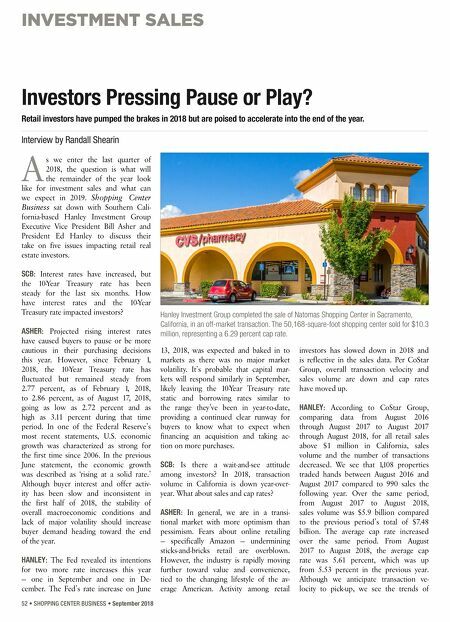 INVESTMENT SALES 52 • SHOPPING CENTER BUSINESS • September 2018 A s we enter the last quarter of 2018, the question is what will the remainder of the year look like for investment sales and what can we expect in 2019. Shopping Center Business sat down with Southern Cali- fornia-based Hanley Investment Group Executive Vice President Bill Asher and President Ed Hanley to discuss their take on five issues impacting retail real estate investors. SCB : Interest rates have increased, but the 10-Year Treasury rate has been steady for the last six months. How have interest rates and the 10-Year Treasury rate impacted investors? ASHER : Projected rising interest rates have caused buyers to pause or be more cautious in their purchasing decisions this year. However, since February 1, 2018, the 10-Year Treasury rate has fluctuated but remained steady from 2.77 percent, as of February 1, 2018, to 2.86 percent, as of August 17, 2018, going as low as 2.72 percent and as high as 3.11 percent during that time period. In one of the Federal Reserve's most recent statements, U.S. economic growth was characterized as strong for the first time since 2006. In the previous June statement, the economic growth was described as 'rising at a solid rate.' Although buyer interest and offer activ- ity has been slow and inconsistent in the first half of 2018, the stability of overall macroeconomic conditions and lack of major volatility should increase buyer demand heading toward the end of the year. HANLEY : The Fed revealed its intentions for two more rate increases this year — one in September and one in De- cember. The Fed's rate increase on June 13, 2018, was expected and baked in to markets as there was no major market volatility. It's probable that capital mar- kets will respond similarly in September, likely leaving the 10-Year Treasury rate static and borrowing rates similar to the range they've been in year-to-date, providing a continued clear runway for buyers to know what to expect when financing an acquisition and taking ac- tion on more purchases. SCB : Is there a wait-and-see attitude among investors? In 2018, transaction volume in California is down year-over- year. 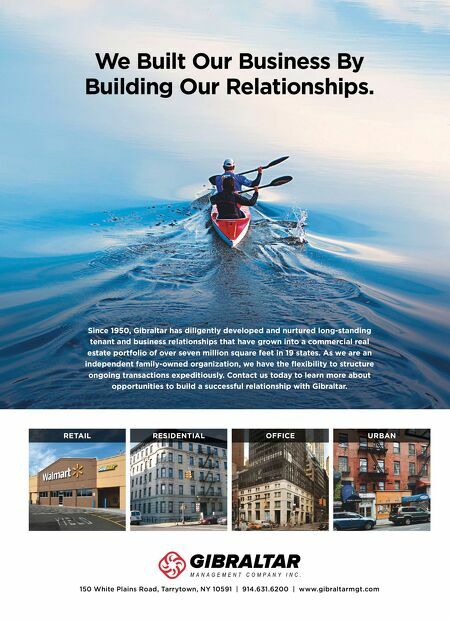 What about sales and cap rates? ASHER : In general, we are in a transi- tional market with more optimism than pessimism. Fears about online retailing — specifically Amazon — undermining sticks-and-bricks retail are overblown. However, the industry is rapidly moving further toward value and convenience, tied to the changing lifestyle of the av- erage American. Activity among retail investors has slowed down in 2018 and is reflective in the sales data. Per CoStar Group, overall transaction velocity and sales volume are down and cap rates have moved up. HANLEY : According to CoStar Group, comparing data from August 2016 through August 2017 to August 2017 through August 2018, for all retail sales above $1 million in California, sales volume and the number of transactions decreased. We see that 1,108 properties traded hands between August 2016 and August 2017 compared to 990 sales the following year. Over the same period, from August 2017 to August 2018, sales volume was $5.9 billion compared to the previous period's total of $7.48 billion. The average cap rate increased over the same period. From August 2017 to August 2018, the average cap rate was 5.61 percent, which was up from 5.53 percent in the previous year. Although we anticipate transaction ve- locity to pick-up, we see the trends of Investors Pressing Pause or Play? Retail investors have pumped the brakes in 2018 but are poised to accelerate into the end of the year. Interview by Randall Shearin Hanley Investment Group completed the sale of Natomas Shopping Center in Sacramento, California, in an off-market transaction. The 50,168-square-foot shopping center sold for $10.3 million, representing a 6.29 percent cap rate.